Welcome to the official Patton Cabin website! Please click on the different pages under the Navigation menu to learn more about the Patton Cabin. The Patton Cabin will be open on 5/06/17 from 12:00 to 5:00 PM during the Illinois Route 66 Red Carpet Corridor Event. 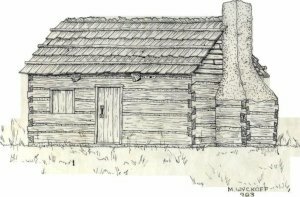 Drawing of the Patton Cabin.